My brother Richard and I started our trip in Wytheville Va. at 6:00 Thursday morning. 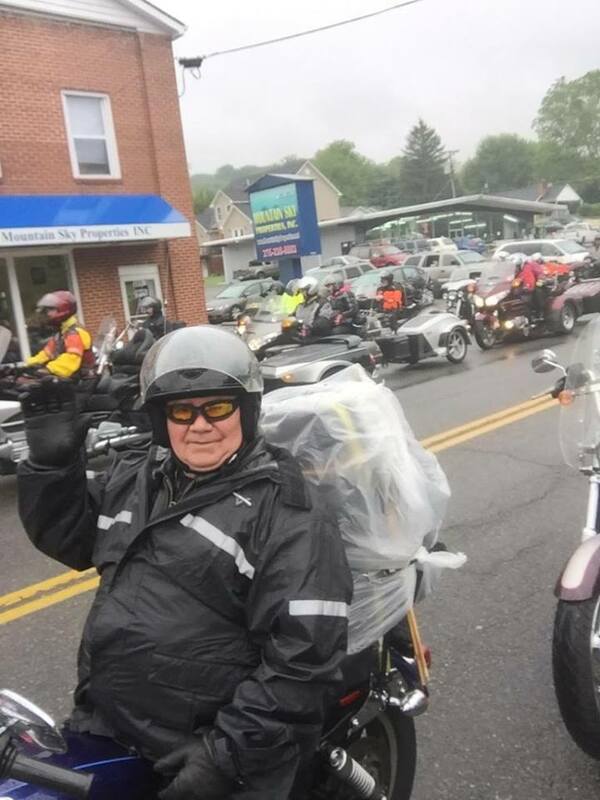 The weather report was calling for rain to set in this morning, and it did about 8:30, luckily I had put on my rain suit, from Fox Creek Leather, before I left home. Spiller Elementary school did a program, in the rain, which was very patriotic and moving. They had ribbons on rubber bands that they passed out to all the riders for good luck as they shook hands and talked to the vets. I intend to take my ribbon back to the school this week to show them how they held up after about 700 miles of riding. Knotted and frayed!! Streets were lined with people waving flags and cheering us on even in the rain. We headed north on Rt. 81 to the Montvale Elementary school in Bedford where we had lunch and a wonderful program by the kids. We headed north on Rt. 81 headed for the D-Day Memorial in Lynchburg. At the Memorial we took pictures, and had group photos taken. We then headed for Lynchburg Harley Davidson. Everyone was glad to sit, eat, and enjoy the music before departing for our hotels. 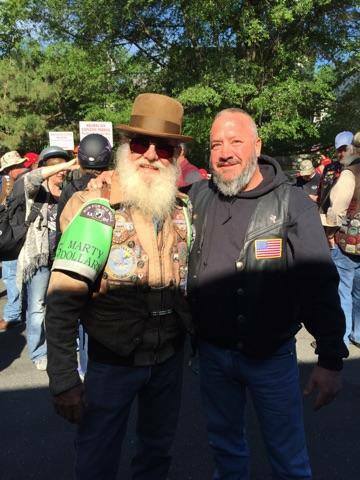 Richard (on the right), at Ride to the Wall festivities. We had made 2 fuel stops along the way of which the fuel was provided free. I was very impressed by the way; gas stations, local police, state police and our road guards handled the fueling of about 400 bikes in about 30 min. Morning came early as we had to be at Tree of Life Ministries at 5:15. We left the hotel at 5:00, and already the road guards were out with flags and flash lights directing the way. After a great breakfast and Award Ceremony, we were lucky enough to receive a pass to get into Arlington Cemetery on Saturday. Only 400 bikes would be allowed to go in. We departed for Staunton, next gas stop, then to Front Royal for more gas and lunch provided by Reality Ministries International, then on to D.C., and our hotels. Saturday meant staging the bikes and a riders meeting in Arlington for the ride to the cemetery. Rules were put into place as to procedure into the Cemetery as well as while there. We attended a Wreath Laying at the Tomb of the Unknown Solider and were allowed time to visit the cemetery. We then headed to the Lincoln Memorial for group photos and time to visit Thunder Alley. 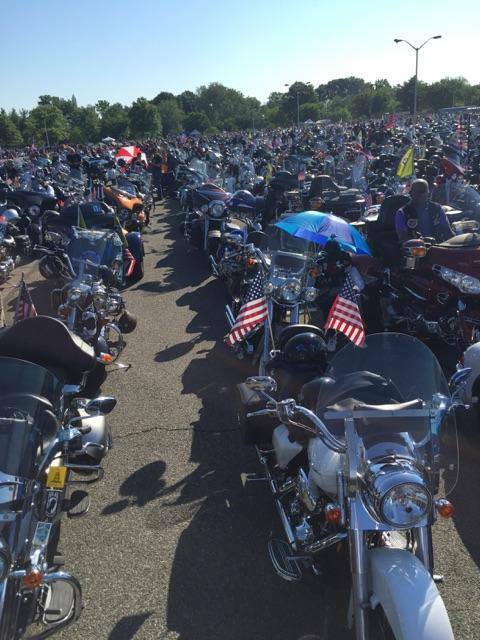 Sunday was the big day for all the bikes to meet at the Pentagon parking lots. We made new friends there as well as along the way. The 5 days we were involved with Rolling Thunder, was a very humbling experience. Lots of emotion, memories, and fun. With so many veterans present you could feel the respect among everyone. We were truly on a mission to lay a wreath at the Viet Nam Veterans Memorial. On Friday afternoon, at 1:30, the mission was accomplished. 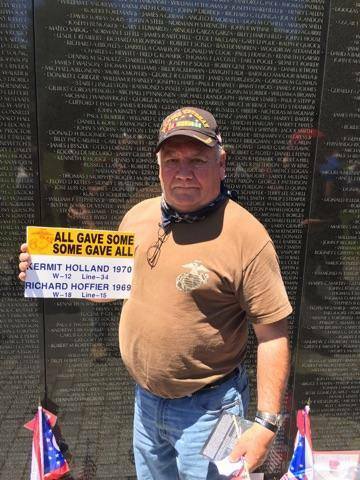 Tears were shed, hugs were shared, and the Wall was saluted. I was truly honored to be allowed to a small part of such a meaningful event.